While blogs can be used to communicate all types of things, many people choose to use them as a way to give feedback for services they have used, and sometimes this feedback could be bad, especially if it is about your company. Because people are using their blogs as a direct tool to publish their thoughts, opinions and rants, blogs turn into a great resource to generate new leads or to reach out to people that were not satisfied with a service or product that you provided to them. There are tons of Q&A sites across the internet, with hundreds of thousands of questions being asked on a daily basis. Sounds like a great way to generate leads, doesn’t it? With people asking direct questions related to a specific field, there may not be an easier or more direct way to connect with people that need help in your industry. 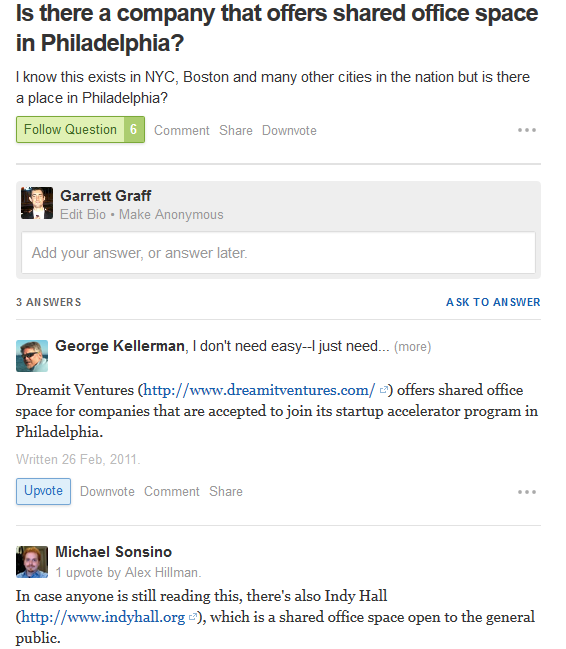 Once again using the topic of office space, we’re going to run a quick search on Quora for “office space Philadelphia” to try and track down some leads for people looking for a place to work. The very first post to come up is from an individual looking for shared office space in the Philadelphia area, exactly what we are looking for. After clicking on the question, we can see that a few people have already answered the question. They might even be our competitors! If we had office space for rent, we could reply to the question with a link to our website and a brief summary of what makes our shared office space better to the competitors, and even list a direct phone number so the asker could contact us directly. Disclaimer: some of the answers sites frown upon providing commercial information in answers to questions.